Satisfy your inner culture vulture at The Rocks and Art Gallery of New South Wales. Escape the urban bustle at Coogee Beach and Bondi to Coogee Beach Coastal Walk. You'll find plenty of places to visit near Sydney: Bouddi National Park (in Killcare), Blackheath (Logan Brae Orchard, Perry's Lookdown, & more) and Megalong Valley (Coachwood Glen Nature Trail & Old Ford Reserve). Spend the 22nd (Tue) exploring nature at Kamay Botany Bay National Park. Spend the 8th (Fri) exploring nature at Georges River National Park. The adventure continues: see a show at Sydney Opera House, take a stroll through Darling Harbour, scramble along the landscape with a canyoning and rapelling tour, and take in the awesome beauty at Pulpit Rock Lookout. 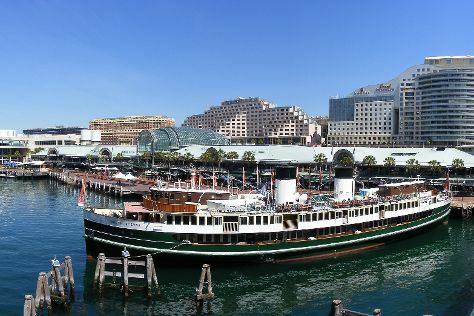 To see other places to visit, where to stay, maps, and more tourist information, you can read our Sydney trip itinerary site . If you are flying in from Germany, the closest major airport is Sydney Kingsford Smith International Airport. In January, plan for daily highs up to 32°C, and evening lows to 23°C. Wrap up your sightseeing on the 22nd (Fri) early enough to travel back home.